This paper investigates the effects of transformational leadership on team effectiveness. In particular, we studied the effects of transformational leadership on three criteria of team effectiveness: viability, team process improvement, and quality of group experience. In addition, we examined the indirect effect of transformational leadership on team effectiveness via affective team commitment. Ninety teams working in different organizational contexts in Portugal were surveyed. Two different questionnaires were administrated, respectively, to team members and team leaders. Team members (N = 445) were surveyed about leadership, team commitment, and quality of the group experience, whereas team leaders (N = 90) were asked to assess team viability and team process improvement. Hypotheses were tested through structural equation modelling. Results revealed that affective team commitment partially mediates the relationship between transformational leadership and quality of the group experience. The mediational role of affective team commitment between transformational leadership and both team viability and team process improvement was not supported. Implications for practice and suggestions for further research are provided. El objetivo de esta investigación fue contribuir a aclarar los efectos del liderazgo transformacional en la eficacia de los equipos. Hemos estudiado los efectos directos e indirectos del liderazgo transformacional en tres criterios de eficacia del equipo: la viabilidad, la mejora del proceso en equipo y la calidad de la experiencia grupal. Además, analizamos el efecto indirecto del liderazgo transformacional en la eficacia grupal a través del compromiso afectivo con el equipo. Se encuestó a 90 equipos que trabajaban en diferentes contextos organizacionales en Portugal. Se administraron dos cuestionarios diferentes respectivamente a los miembros del equipo y a los líderes. Los miembros del equipo (N = 445) fueron encuestados sobre el liderazgo, el compromiso con el equipo y la calidad de la experiencia grupal, mientras que a los líderes (N = 90) se les pidió que evaluasen la viabilidad del equipo y la mejora del proceso en equipo. Las hipótesis se examinaron mediante modelos de ecuaciones estructurales. Los resultados revelaron que el compromiso afectivo con el equipo media parcialmente la relación entre el liderazgo transformacional y la calidad de la experiencia grupal. El rol de mediación del compromiso afectivo del equipo entre el liderazgo transformacional, la viabilidad de éste y la mejora del proceso en equipo, no ha sido sustentado empíricamente. Además, presentamos implicaciones para la práctica y sugerencias para futuras investigaciones. In the present day, organizations worldwide tend to structure their work around teams and workgroups1 to perform more rapidly, flexibly, and adaptively (Kozlowski & Ilgen, 2006). The various applications of teams in organizations have led to an approach that emphasizes their nature as finalized systems and the emergence of a new focus dedicated to this issue: effectiveness (Mathieu, Maynard, Rapp, & Gilson, 2008). Because the effectiveness of teams matters for individual, organizational, and societal well-being, it is essential to study processes to promote it (Kozlowski & Ilgen, 2006). According to Bass (1999), changes in the marketplace and in the workforce led to a need to adopt a transformational leadership style. These leaders foster followers in going beyond immediate self-interests, elevating their maturity as well as showing concern for achievement, self-actualization, and well-being of subordinates (Bass, 1999). They also influence followers’ values, emotions, and attitudes and motivate them to perform beyond their expectations (Yukl, 2012). By guiding employees towards greater levels of achievement, transformational leadership has become crucial to promoting team effectiveness. The literature about transformational leadership theory and effectiveness supports the association between these two constructs (Avolio, 2010). Various studies demonstrate that perceived transformational leadership is related to positive team outcomes in various work settings, both public and private (Bass & Bass, 2009; Trottier, Van Wart, & Wang, 2008). Although research has mainly focused on the direct effects of transformational leadership on team outcomes, some studies suggest that transformational leadership affects effectiveness indirectly, for instance, through the involvement of team members (Podsakoff, MacKenzie, Moorman, & Fetter, 1990; Zaccaro, Rittman, & Marks, 2001). However, the process by which transformational leaders exert their influence, through mediating variables, on followers’ team effectiveness has not been sufficiently addressed in the literature (Givens, 2008). In this paper we propose that affective team commitment mediates the relationship between transformational leadership and team effectiveness (see Figure 1). Transformational leaders have the capacity to motivate team members to work harder and beyond what is expected for the sake of the group (Polychroniou, 2009). Thus, transformational leaders make team members more committed to the team and, consequently, more likely to work together over time, implement new ways of working, and have a better work experience. Overall, team effectiveness would be enhanced (Strauss, Griffin, & Rafferty, 2009). A study on sport settings (Van Beek, 2011) found that affective team commitment mediates the relation between transformational leadership and team performance. In the present study, we extend the analysis of the mediating role of team commitment in the relationship between transformational leadership and team effectiveness, using organizational teams. Moreover, we expand on previous research, taking into consideration other criteria of team effectiveness, namely team viability, team process improvement, and quality of group experience. Transformational leadership has been one of the most widely studied leadership theories over the last three decades (Bass, 1991; Judge & Piccolo, 2004; Zhu, Newman, Miao, & Hooke, 2013). The theory was introduced by Bass (1985), who developed ideas laid down by Burns (1978). Transformational leadership was conceptualized as being composed by four independent dimensions, known as the four “I”s (Bass, 1985; Bass & Avolio, 1994; Judge & Piccolo, 2004): inspirational motivation (the sense of drive that the leader inspires in followers and that produces additional, goal-oriented energy for the group or organization), intellectual stimulation (the boost in creativity in followers that the leader stimulates by encouraging an independent and innovative way of thinking), idealized influence (exemplary behaviour of the leader that generates respect and trust and makes followers proud of their group and organization), and individualized consideration (perception that the leader genuinely cares for followers and their well-being). In a review of the literature focused on transformational leaders’ behaviours, Podsakoff et al. (1990) concluded that such leaders typically show six core behaviours: identification and articulation of a vision, implementation of an appropriate model, encouragement to accept group goals, high performance expectations, individualized support to staff, and intellectual stimulation. Based on this model, Carless, Wearing, and Mann (2000) distinguished between leaders’ behaviours that provide support to staff and those that encourage their individual development. Hence, their model describes seven behaviours implemented by transformational leaders: (1) communicating a vision, (2) developing staff, (3) providing support, (4) empowering staff, (5) being innovative, (6) leading by example, and (7) being charismatic. These behaviours may have a strong impact on team processes and also on team effectiveness, which is the focus of this study. But what is team effectiveness and how is it defined? Cohen and Bailey (1997) categorized effectiveness into three categories: performance, attitudes, and behaviours. However, criteria to define team effectiveness have changed over the past decade to include many different forms and combinations. In this sense, what constitutes “effectiveness” has become more complex in recent years (Mathieu et al., 2008). Despite the availability of many perspectives and representations of team effectiveness (Lourenço, Miguez, Gomes, & Carvalho, 2004), team effectiveness is a concept that is not easy to define, since it does not correspond to an objective reality. Rather, it has been proposed that effectiveness should be analysed and measured according to the values, interests, and preferences of the actors and systems to which it refers to (Dimas, Alves, Lourenço, & Rebelo, 2016). Hackman (1987) provided a model of team effectiveness that received strong support. According to this model, team effectiveness is defined and can be evaluated using three different criteria: 1) the degree to which team’s product or service meets, or exceeds, the standards of quantity and quality of those who receive, review, and/or use it; 2) the degree to which social processes within the team maintain, or enhance, the ability of the group to work together and become a more competent and better-performing unit over time; 3) the degree to which the group experience satisfies members’ needs and increases members’ satisfaction, well-being, and development (Hackman, 1987; 2012). In line with this embracing perspective, in the present paper we consider three criteria to evaluate team effectiveness: team viability, which can be defined as the capacity of the team to adapt to changes and to cope with challenges in an ever-changing environment (Aubé & Rousseau, 2005; Boies & Howell, 2009); team process improvement, the capacity of team members to enhance existing processes and find innovative ways to improve team outcomes (Kirkman, Rosen, Tesluk, & Gibson, 2004); and quality of group experience, which is the degree of positive social climate within the working group (McGrath, 1991). A positive relation has been observed between transformational leadership and team viability (Boies & Howell, 2009). Other studies revealed a positive and direct relationship between transformational leadership and innovative work behaviours, which is related to team process improvement, since both concern the ability of the team to implement new ways of working (Gumusluoglu & Ilsev, 2009; Reuvers, Van Engen, Vinkenburg, & Wilson-Evered, 2008). Also, Van Dierendonck, Haynes, Borrill, and Stride (2004) found that transformational leadership has a positive relation with the well-being of followers, which is close to the concept of quality of group experience. For these reasons, we expect transformational leadership to be positively related to the three criteria of team effectiveness we are considering in this study. H1: Transformational leadership will be positively related to team viability (H1a), to team process improvement (H1b), and to quality of group experience (H1c). Transformational leadership has been related to followers’ identification with the leader and consequently social identification with the group or organization concerned (Kark, Shamir, & Chen, 2003). For this reason, the leadership style has been considered a main determinant of organizational commitment (Avolio, Zhu, Koh, & Bhatia, 2004; Mowday, Porter, & Steers, 2013). According to Meyer and Allen (1991) and Allen and Meyer (1996), organizational commitment is represented by three distinct dimensions: affective commitment (the affective orientation toward a group or organization), normative commitment (the perception of obligations to remain in the organization), and continuance commitment (the recognized costs of leaving the organization). Several authors (e.g., Kozlowski & Ilgen, 2006) consider commitment as a valuable team state to predict team effectiveness. Affective commitment denotes an emotional relationship that the individual develops toward the organization, associated with the identification and involvement with it (Martins, Rebelo, & Tomás, 2011). Meyer and Allen (1991), affirmed that affective commitment is likely to have the greatest impact on an employee’s organization-relevant behaviour; later, Meyer, Becker, and Vanderberghe (2004) reported that “research shows that affective commitment has the strongest positive correlation with job performance, organizational citizenship behaviour, and attendance, followed by normative commitment” (p. 993), while continuance commitment seems to be unrelated, or negatively related, to these behaviours. Thus, considering the stronger relation of affective commitment with employees’ job-relevant behaviours, in this study we focus on affective commitment and, in particular, on affective team commitment. It has in fact been observed that commitment to a specific target, for instance one’s own team, would be a better predictor of behaviours relevant to that target than a general organizational commitment (Herscovitch & Meyer, 2002). Hsu and Mujtaba (2011), for example, focused their attention on team level commitment. H2: Transformational leadership will be positively related to affective team commitment. Affective team commitment can produce different positive outcomes. Involving the experience of positive affective states, it can encourage team members to engage in proactive behaviours (Parker, 2007), promote unstructured and original behaviours (George, 1990), and encourage individuals to set harder and more stimulating objectives (Isen & Reeve, 2005). Several studies have found that affective team commitment is positively related to some dimensions of team effectiveness, such as perceived team member proficiency (Strauss et al., 2009) and willingness to promote initiatives to improve (Ng, Feldman, & Lam, 2010). These studies suggest that employees affectively commit to team work plans, specify team tasks in advance, and are willing to improve the team in terms of products and processes. Affective team commitment was also found to be strongly correlated with positive affect, which is at the base of team viability and quality of group experience (Marchand & Vandenberghe, 2013). Bentein, Vandenberghe, Vandenberg, and Stinglhamber (2005) in their longitudinal study also observed that affective team commitment was negatively related to turnover intentions. Turnover intentions refer to the intention to leave the team, which can undermine team viability. It is supposed that when team members have emotional attachments to their teams and are really committed to them, they behave in ways that produce beneficial outcomes to the teams (Van Beek, 2011), thus improving team processes and team outputs. H3: Affective team commitment will be positively related to team effectiveness, namely to team viability (H3a), team process improvement (H3b), and quality of group experience (H3c). Although functions of transformational leadership have been extensively examined, reviewing literature on leadership behaviours that help the team to make good and appropriate use of its collective resources when performing a task, Hackman and Wageman (2005) indicated that leadership studies should focus much more on conditions that foster team effectiveness. However, an increasing number of studies (e.g., Moynihan, Pandey, & Wright, 2012) suggests that a large part of the influence that transformational leadership generate is tangible but indirect. Thus, in other words, leaders promote conditions for team success directly, but even more by shaping key mediating variables. During the past decade, researchers have begun to give more attention to “mediating processes that explain why certain inputs affect team effectiveness and viability” (Ilgen, Hollenbeck, Johnson, & Jundt, 2005, p. 519). For example, despite the direct effect of transformational leadership on innovation processes (Gumusluoglu & Ilsev 2009; Reuvers et al., 2008), a recent study conducted with teams of nurses found that transformational leadership did not influence innovation behaviours directly, but through patient safety climate and innovation climate (Weng, Huang, Chen, & Chang, 2015). Similarly, in a study conducted in military settings, the relation between transformational leadership and team viability was mediated, partially and significantly, by the positive affective processes of team members (Boies & Howell, 2009). Although transformational leadership has a very important direct effect on outcomes, we believe that it may also indirectly affect team effectiveness when team members are committed to the team. Bass and Bass (2009) suggest that transformational leadership increases team effectiveness because of its impact on proactive work role behaviours, and according to Strauss et al. (2009) and Parker (2007), proactive work role behaviours are strongly related to affective commitment. H4: Affective team commitment will mediate the relationship between transformational leadership and team effectiveness, namely, between transformational leadership and team viability (H4a), team process improvement (H4b), and quality of group experience (H4c). In this study, a cross-sectional design was used to survey teams from a wide range of Portuguese organizations. After the first stage, in which organizations were contacted and the investigation project was presented, data collection was arranged and additional information on research design and informed consent were provided to organizations that agreed to participate. Data were collected using both paper and online surveys. Members of working teams and their respective leaders answered two different questionnaires. Team leaders answered items related to two dimensions of team effectiveness: team viability and team process improvement. These dimensions of team effectiveness were assessed by team leaders based on the previous work of Rousseau and Aubé (2010), who assumed that the immediate supervisors are knowledgeable about the results of their own teams and can reliably assess them. Team members answered items related to transformational leadership, team commitment, and the third team effectiveness dimension (quality of group experience). Criteria for selecting the teams were: 1) the group has to be formally recognized in the organization as a team, 2) the team has to be formed at least by three members (excluding the leader), and 3) the leader (supervisor) has to be formally recognized, too. The final sample consisted of 90 working groups, with an average of 7 members per group (SD = 5.16). At least 60% of team members answered the questionnaire. The 90 teams belong to 40 Portuguese organizations, which were respectively large (18.5%), medium (47%), small (18.5%), and micro (16%) organizations. Such organizations work in different sectors of activity, being the most representative ones the service sector (34.2%), followed by industry (17.1%) and research (9.8%). Four hundred and forty-five team members answered the survey; around fifty percent were women (52.9%), and the participants’ ages ranged from 18 to 67 years old (M = 35.49, SD = 10.03). Education varied from elementary school to PhD, with secondary high school as mode (38.4%). Seniority in the organization was approximately 9 years and ranged from 1 month to 43 years (SD = 8.46). The average time for each employee in the team was 5 years and ranged from 1 month to 33 years (SD = 5.71). Finally, the daily face-to-face interaction between team members was about 5 hours (SD = 2.82). The sample of the team leaders consisted of 90 individuals; 66.3% were men, and the participants’ ages ranged from 18 to 67 years old (M = 39.38, SD = 9.91). The average time for each leader with the current team was 8 years (SD = 6.9), and 14 years with the current organization (SD = 7.8). Education varied from elementary school to PhD, with secondary high school education (48.8%) as mode, followed by bachelor’s degree background (45.4%). Transformational leadership. Transformational leadership was assessed by team members through the Global Transformational Leadership (GTL) scale developed by Carless et al. (2000). The scale was adapted for the Portuguese language by Van Beveren, Dimas, Lourenço, and Rebelo (2017). This scale assesses transformational leadership as a unique construct represented by the seven intrinsic behaviours considered in Carless et al.’s (2000) model. Thus, it is composed of seven items evaluated on a 5-point Likert-type scale ranging from barely applies (1) to applies fully (5). A sample item is: “My leader communicates a clear and positive vision for the future”. Affective team commitment. Affective team commitment was assessed by team members through the Affective Commitment Scale (ACS) from the Three-Component Model (TCM) of commitment, revised by Meyer and Allen (2004) and adapted for the Portuguese language at the organizational level (Martins et al., 2011) but not yet at the team level (the validation process of the scale is presented in the Results section). This scale is composed of 6 items that are measured on a 5-point Likert scale ranging from totally disagree (1) to totally agree (5). Three items are positive statements while the other three are negative statements and were reversed to compute the total score. A sample item is: “I do not feel like part of the family in this group”. Team effectiveness. Team effectiveness was measured through team viability, team process improvement, and quality of group experience. The Team Viability scale, developed and validated by Aubé and Rousseau (2005), contains four items to measure the team’s capability to adapt in a changing environment, to integrate new members and to keep working as a whole in the future. Team leaders evaluated team viability of their respective team on a 5-point Likert-type scale from barely applies (1) to it applies fully (5). The psychometric properties of the Portuguese version of the scale were tested in a previous study with exploratory factor analysis (EFA), and Cronbach’s alpha was .74 (Albuquerque, 2016). The model obtained with the EFA was later confirmed by Pessoa (2016) using CFA, and in this case Cronbach’s alpha was .72. A sample item is: “Team members adapt to the changes that occur in their work environment”. The Team Process Improvement scale, developed and validated by Rousseau and Aubé (2010), contains five items that measure the team’s capacity to enhance existing processes and find innovative ways to improve team outcomes. Team leaders evaluated team process improvement of their respective team on a 5-point Likert-type scale from barely applies (1) to it applies fully (5). The psychometric properties for the Portuguese version of the scale were tested through EFA, and Cronbach’s alpha was .89 (Albuquerque, 2016). The model obtained through the EFA was confirmed by CFA (Pessoa, 2016) and Cronbach’s alpha was .86. A sample item is: “The members of this team have successfully implemented new ways of working to be more productive”. The Quality of Group Experience scale, developed and validated by Aubé and Rousseau (2005), contains three items concerning the social climate within the team. Team members evaluated quality of group experience in their own team on 5-point Likert scale from totally disagree (1) to totally agree (5). The psychometric properties for the Portuguese version of the scale were tested through EFA and the Cronbach’s alpha obtained was .95 (Albuquerque, 2016). A sample item is: “In our team there is a good working climate”. Control variable. Team size was included in this study as a control variable because several investigations have demonstrated that the number of team members affects team processes (e.g., Aubé & Rousseau, 2005). To get such information, team leaders answered an item on team size. Before testing the hypotheses, we analysed the psychometric properties of the Team Affective Commitment scale, since the team adaptation of this scale was not previously validated for the Portuguese language. The total sample was randomly divided into two sub-samples in order to obtain evidence of cross-validity. In the first sub-sample, composed of 220 subjects, we conducted an exploratory factor analysis (EFA), while in the second sub-sample, composed of 225 subjects we conducted a confirmatory factor analysis (CFA). Before performing the EFA we checked if scores were normally distributed and the factorability of the correlation matrix. The Kaiser-Meyer-Olkin measure of sampling adequacy and Bartlett’s test of sphericity showed good results, KMO = .80, χ2(15) = 541, p < .001. Thus, we ran the EFA with principal components extraction. The factorial solution showed one factor, with all item loadings higher than .55. The Cronbach’s alpha of the scale was .82. Then the model obtained through the EFA was tested using CFA. Following the recommendations of Byrne (2010), we checked the chisquare test, the CFI (comparative fit index), and the RMSEA (root mean square error of approximation) and its confidence interval (see Table 1). The results of the CFA indicated a poor goodness of fit, showing an inadequate adjustment between data and the hypothesized model, χ2(9) = 110.45, p <.001, CFI = .84, RMSEA = .22, intervals of confidence 90% between .19 and .26, statistically significant (Table 1). After adjustments were made considering both the statistical (namely the modification indices provided by AMOS) and the theoretical basis (removing item 3 for overlapping content and correlating errors of item 1 and item 4), a significant improvement in fit indices was obtained, χ2(4) = 3.34, p = .501, Δχ2(1) = 35.14, p < .001, CFI = 1.00, RMSEA = .00; intervals of confidence 90% between .00 and .09, statistically significant, which showed a good fit between the variance-covariance matrix and the tested model. Cronbach’s alpha was .83. Note. N = 90 teams. *p < .05., **p < .01, ***p < .001. All constructs considered in this study were at team level. However, transformational leadership, team commitment, and quality of group experience measures were collected individually from each team member. To examine whether the data justified the aggregation of team-level constructs, the average deviation index (ADM index), developed by Burke, Finkelstein, and Dusig (1999), was computed. The average ADM values obtained for transformational leadership (M = 0.50, SD = .028), affective team commitment (M = 0.52, SD = 0.31) and quality of group experience (M = 0.40, SD = 0.27) were below the upper-limit cut-off criterion of 0.83 suggested by the authors. This revealed that the level of agreement within the teams was sufficient to aggregate team members’ scores with confidence to the team level. Furthermore, we checked if such aggregation was justified calculating the intraclass correlation coefficients ICC(1) and ICC(2) (Bliese, 2000) with the tool developed by Biemann, Cole, and Voelpel (2012). The ICC(1) value for transformational leadership (GTL) was .33, the ICC(1) value for affective team commitment was .16, and the ICC(1) value for quality of group experience was .22, whereas the ICC(2) values for the same variables were .71, .49, .58, respectively. Overall, the values were in line with the values considered acceptable in the literature (Bliese, 2000; Klein & Kozlowski, 2000) and provided support for aggregating data to team level. Table 2 reports means, standard deviations, ADM, ICCs, correlations, and reliability coefficients of the variables considered in this study. Team size was included as control variable and only quality of group experience was significantly related to team size. Table 2 shows that correlations between all variables considered are positive and significant, which is in line with what was expected in the hypotheses. Note. TL = transformational leadership; ATC = affective team commitment; QGE = quality of group experience. Reliability coefficients (Cronbach’s alpha) are reported in brackets. N = 90 teams. *p < .05, **p < .01, ***p < .001. We tested our hypotheses using structural equation modelling. A path analysis model was studied using AMOS software. This approach allows the indirect effects in the model to be estimated (Preacher & Hayes, 2008). We used scale means as single indicator for each construct in the study. The aggregated database was used for this analysis (N = 90 teams). Parameters of the model were estimated through the maximum likelihood method. In the model, on the basis of the observed significant correlation, we also controlled the effect of team size on the quality of group experience. Table 3 shows that the findings of the first model (M1) indicated a poor goodness of fit between data and the hypothesized model, χ2(6) = 28.35, p < .001, CFI = .86; RMSEA = .20, intervals of confidence 90% between .13 and .28, statistically significant. Because conditions suggested by Kline (2011) were not met by the model (χ2/df ratio < 3, CFI > .90, and RMSEA < .08), this revealed the need to adjust it. The modification indices (MI) provided by the AMOS program indicated the existence of a high modification rate for the covariance of the error of indicator team viability and the error of team process improvement (MI = 21.4). Thus, we added a covariance parameter between the residual parameters of team viability and team process improvement. We did so based on the suggestions of Schreiber, Nora, Stage, Barlow, and King (2006). According to these authors, parameter constraints may be changed to improve the fit of the model if such modifications are justified theoretically. So, besides the statistical reasons provided by the software, we expected that the two criteria would be correlated to each other because they represent dimensions of the same construct, which is team effectiveness (Mathieu et al., 2008). Finally, Table 2 confirms that these two criteria are highly correlated (r = .56). This procedure allowed a significant improvement in the quality of fit indices, M2: χ2(5) = 3.93, p > .05, Δχ2 = 24.42, p < .001, CFI = 1.00, RMSEA = .00, intervals of confidence 90% between .00 and .13, not significant, revealing a good fit between data and the hypothesized model (see Table 3). N = 90 teams. *p < .05, **p < .01, ***p < .001. Once it was established that Model 2 was superior to Model 1, we went through the analysis using bootstrap approximation using a two-side bias-corrected 95% confidence interval with 1,000 samples. Standardized direct and indirect (mediated) effects were estimated (Figure 2) to provide further empirical evidence for our hypotheses (Hayes & Scharkow, 2013). Hypothesis 1 concerned the direct positive relationship between transformational leadership and the three criteria of team effectiveness. The estimated direct effects of transformational leadership on team viability (β = .27, p = .02) and quality of group experience (β = .26, p = .002) were significant, but not the direct effect on team process improvement (β = .21, p = .07). These results provided support for Hypotheses 1a and 1c but not Hypothesis 1b. Hypothesis 2 concerned the direct positive relationship between transformational leadership and affective team commitment. The estimated direct effect of transformational leadership on affective team commitment (β = .54, p = .001) was significant. This result provided support for Hypothesis 2. Hypothesis 3 concerned the direct positive relationship between affective team commitment and the three criteria of team effectiveness. The estimated direct effect of affective team commitment on quality of group experience (β = .56, p = .001) was significant, on team process improvement was not significant (β = .22, p = .06), and on team viability (β = .14, p = .24) was not significant. These mixed results provided support for Hypothesis 3c, but failed to support hypotheses 3a and 3b. Figure 2 Results of Path Analysis Model. Hypothesis 4 stated that affective team commitment mediates the relationship between transformational leadership and the three criteria of team effectiveness. The results showed that the estimated indirect effects (Table 4) of transformational leadership through affective team commitment on team viability was .07 (p = .18), on team process improvement was .12 (p = .04), and on quality of group experience was .30 (p = .001). Because the direct path between transformational leadership and quality of group experience (β = .26, p = .004) remained significant, we can support the hypothesis that affective team commitment positively and partially mediates the relationships between transformational leadership and quality of group experience. Conversely, Hypotheses 4a and 4b were not supported. Note. N = 90 teams. *p < .05, **p < .01. Transformational leadership plays a crucial role in teams and contributes to their overall effectiveness (e.g., Boies & Howell, 2009; Reuvers et al., 2008). At the same time, an essential role is represented by affective team commitment that is fundamental to several aspects of team effectiveness (e.g., Neininger, Lehmann-Willenbrock, Kauffeld, & Henschel, 2010; Strauss et al., 2009). Contributing to the literature on transformational leadership and in line with the previous findings, our results supported the hypothesis that leaders who adopt a transformational style of leadership are able to generate positive results in team viability and quality of group experience (Hypotheses 1a, 1c). This means that transformational leaders may boost the effectiveness of their teams by encouraging team members to cope with environmental challenges and motivating them to continue to stay and work together. We expected this direct effect also on team process improvement (Hypothesis 1b). However, the effect of transformational leadership on this dimension appears not to be statistically significant. This dimension implies removal of defects or deficiencies, and establishment of new practices to increase productivity. It is possible that the influence of the leader is not sufficient to push team members to improve in this direction. In line with previous literature, our findings support the hypothesis that leaders with a transformational style have a positive effect on the affective commitment that members have toward their teams (Hypothesis 2). Thus, team members that are led by a transformational leader will be emotionally committed to their respective team. According to the social exchange theory (Blau, 1964), the positive relationship with the leader is reciprocated with a stronger affective commitment to the team and the desire to significantly contribute to its development by working harder within the team itself. Experiencing affective team commitment seems to have positive effects also on other aspects of overall team effectiveness. In line with the existing literature, our findings support the hypothesis that team members emotionally bonded to their team have also a group experience of better quality (Hypothesis 3c). This result is in line with and extends previous studies that showed the relation between affective commitment and positive affective processes (Boies & Howell, 2009; Marchand & Vandenberghe, 2013); affective team commitment in fact has an impact not only on individual positive emotions but also supports and promotes the experience of positive social relationships among team members. The literature review suggests that teams in which members are emotionally committed would also report better outcomes in terms of team viability (Hypothesis 3a) and team process improvement (Hypothesis 3b). However, these two hypotheses were not supported: even if correlations between affective team commitment and team viability, and team process improvement, respectively, showed positive significant relations, when, in our path analysis model, affective team commitment is examined with these two criteria of team effectiveness together, its effect loses statistical significance. Regarding team viability, the emotional bond with the team does not seem sufficient to justify the capability of team members to keep working together to cope with challenges. Similarly, for team process improvement, affective team commitment does not seem capable of promoting the implementation of innovative ways of working. In order to innovate team processes and products, teams might need, in addition to team affective commitment, technical skills and/or organizational and cognitive resources, such as skills in the task domain, motivation to innovate, or individual and team learning behaviours (Amabile & Pratt, 2016). 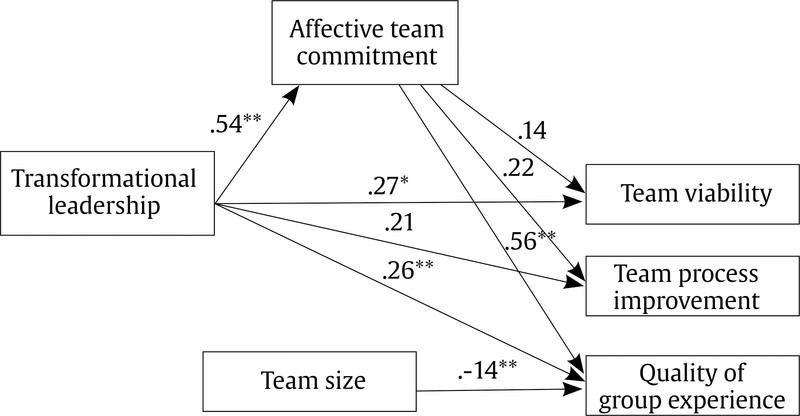 However, it has to be highlighted that the relation between team affective commitment and team process improvement was almost marginally significant (p = .06). Thus, the relation between these two variables is worth further examining in future studies. The main objective in this research was to study the effect of the affective dimension of commitment on overall team effectiveness, when shaped by the transformational leadership style of the team direct supervisor. According to our findings, it seems that transformational leadership has both a direct effect and also an indirect effect, through affective team commitment, on quality of group experience. Thus, affective team commitment positively and partially mediates the relationship between transformational leadership and quality of group experience. This means that the experience of positive social climate within the team is improved when team members are emotionally committed to the team and such commitment is generated by the transformational style of their leaders. This result corroborates the idea that affective aspects such as quality of group experience are strongly affected by affective/motivational team processes and states as it is the case of affective team commitment (Kozlowski, Grand, Baard, & Pearce, 2015). This effect is especially relevant when the latter is shaped by transformational leadership. In contrast with our expectations, the findings do not support the hypothesis concerning the mediating effect of affective team commitment between transformational leadership and team viability. This could mean that transformational leaders may indeed have an effect on the capability of their team to work over time (significant direct effect), but that this might not be affected by the capability of the leader to make team members emotionally committed to the team. Several considerations need to be made about this. First, further research is needed to check if this effect is consistent in other studies. Then, different typologies of teams should be tested as well. Boies and Howell (2009) showed that positive affect positively mediates the relation between transformational leadership and team viability. However, it has to be pointed out that such findings were observed in military settings. Our sample is composed of teams formally constituted within work organizations that have been working together for five years on average, and thus it might be that their capability to keep working together as a whole is shaped by other variables beyond the affective commitment with the team. For instance, it might be interesting to study the role of other mediators such as team climate (Pirola-Merlo, Härtel, Mann, & Hirst, 2002) or network structure (Balkundi & Harrison, 2006). The hypothesis that affective team commitment would mediate the relation between transformational leadership and team process improvement was not significant either. However, it is important to highlight that the level of significance obtained (.06) was near statistical significance. This could mean that transformational leaders may push their team members to create and implement some improvement in their ways of working by shaping their affective commitment, but also by influencing other variables, such as innovation climate (Weng et al., 2015). This means that, although team affective commitment is a variable to take into consideration in the relationship between transformational leadership and team process improvement, other variables need to be included. Our study provides new information about how to improve team effectiveness in organizational teams. Our starting point in this study relied on the importance of recognizing the different aspects of team effectiveness. Often team effectiveness is evaluated as merely team performance (Mathieu et al., 2008), while it is much more than that. Beyond the economical and tangible results of their teams, organizations should focus on other aspects, such as the ability of these teams to keep working as a whole in the future, or their capabilities to create and implement new and effective ways of working, or the overall satisfaction experienced by team members regarding their team work. Even though transformational leadership has a crucial role in fostering team effectiveness (e.g., Van Dierendonck et al., 2004), when team members are emotionally committed to their team, team outcomes such as the quality of group experience tend to increase. The results indicate that affective team commitment partially mediates the relationship between transformational leadership and the quality of group experience, suggesting that transformational leadership has, in addition to a direct effect on member satisfaction with the relations in the team, an indirect effect on it through affective team commitment. Consequently, this study shows that transformational leadership can improve one key criterion of team effectiveness through its relationship with this important emergent state. Because of the great potential of the transformational leadership style, organizations could take measures in selecting and developing their leaders. When it is time to hire or promote team leaders, the candidates that show better capabilities to engage in transformational leadership behaviours should be selected. Moreover, team leaders in organizations might be taught how to modify their style of supervision focusing, for instance, on the main behaviours of the transformational leader suggested by Carless et al. (2000): (1) communicating a vision, (2) developing staff, (3) providing support, (4) empowering staff, (5) being innovative, (6) leading by example, and (7) being charismatic. Previous research has shown that transformational leadership can be trained effectively through focused training programmes (Avolio, 2010) and thus, such programmes should be implemented within organizations if their concern is team effectiveness. Furthermore, affective team commitment shaped by transformational leaders may have a crucial role in organizational teams, enhancing the quality of social relations within the team. This result suggests that organizations should invest in activities that increase affective team commitment as, for instance, team building activities. Even though this type of activity seems not to have a significant effect on team performance, anyway it may help to enhance emotional bonds among team members, their satisfaction for working in a certain workgroup, and, ultimately, team cohesion (Tannenbaum, Salas, & Cannon-Bowers, 1996). In addition, in order to increase team commitment, and consequently the quality of group experience, team leaders should start team building interventions when new teams are formed (Neininger et al., 2010). More research is still needed to further examine the benefits of transformational leadership style and its effects on team functioning and team outputs of their teams, and to understand the advantages and disadvantages that this might bring to organizations. While this study brings further information on the potential effects of transformational leadership on team effectiveness, there are still some limitations that need to be addressed. First of all, because of the cross-sectional design of our study, it is not possible to infer with certainty the casual effects between the variables in the study. Considering the mixed findings of our study, further research should examine these relations using alternative designs such as a longitudinal study or experimental research to provide definitive results on the casual links. Secondly, although we collected data using two different sources (team leaders and team members), which contributes to a more comprehensive and accurate diagnosis and reduces the effects of the common method variance, all variables were assessed through questionnaires. Thus, social desirability bias may have affected respondents. This may have led, for example, to team leaders presenting a favourable picture of the team they were supervising (Rousseau & Aubé, 2010). Moreover, common method variance may, to some extent, have influenced the results, because team members provided data regarding transformational leadership (independent variable), affective team commitment (mediating variable), and quality of group experience (dependent variable). Accordingly, the significant results related to the mediating role of team commitment on the relationship between transformational leadership and the quality of the group experience might be influenced by the fact that all measures were obtained from the same source, team members, while no mediation effect was observed when the dependent variable was assessed by team leaders. Although psychometric properties of the scales used in this study are satisfactory, further research might use different measures to overcome these issues. In this study, results were obtained using path analysis. Future studies should use a multilevel analysis in order to investigate if individual contributions to team effectiveness are influenced by the affective commitment that the team experiences as a whole and/or by the transformational style of the team leader. Regarding team viability, it would be interesting to study the mediational effect of affective team commitment on the relationship between transformational leadership and team viability in different settings and in teams at different development stages. According to Tuckman (1965), teams go through several stages during their lifetime. It is likely that affective team commitment has a greater effect on team viability during the earlier stages of its development, when team members are not yet well-acquainted (Hackman, 2012). Concerning team process improvement, since our findings were marginally significant, future studies should investigate the direct and indirect effects using different measures. Finally, we collected data in Portuguese organizations, and thus our findings may only be applied to the Portuguese population, limiting the external validity of our study. Portuguese organizations may have different characteristics that are not necessarily representative of organizations in other countries. Further studies should test the model proposed in this study in countries other than Portugal.